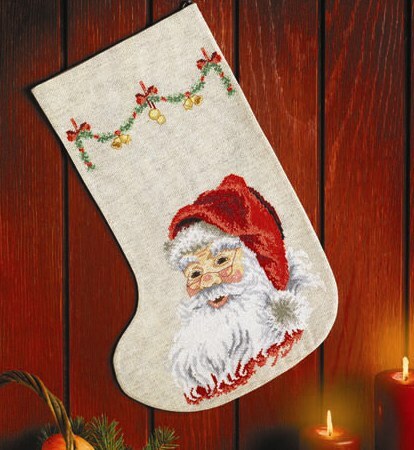 This attractive Christmas stocking should get children of all ages excited about the festive season. The large scale chart is printed on an A3 sheet and the pattern is worked in cross stitch and backstitch using 20 shades of stranded cottons. The stitch count is 120 by 210. This kit contains 14 count Aida in oatmeal, one piece to work and a second for backing, a chart, template for cutting out shape, DMC stranded cottons sorted onto cards, a needle, a hanging ring and instructions.